My apologies for this game review being three weeks late. But better late than never and now that we unofficially know that the Giants’ offensive, defensive, and special teams systems will remain in place in 2016, what transpired against the Philadelphia Eagles on January 3, 2016 does have more meaning. Will Beatty tears his pectoral muscle in May and never returns, causing a domino effect on the offensive line at tackle. Jason Pierre-Paul permanently disfigures himself on July 4th, misses half the season, and returns to play one-handed football. Giants safeties start dropping like flies before the season even starts. Victor Cruz’s “the return” never happens. Jon Beason breaks himself again. The Giants also lose Johnathan Hankins, Owa Odighizuwa, Devon Kennard, Prince Amukamara, Geoff Schwartz, Larry Donnell, and Daniel Fells for much of the season. For the most part, the Giants play competitive football in 2015, but keep painfully losing in the final seconds due to questionable decisions, red zone ineptitude, bad defense, and untimely special teams mistakes. The Giants lost the opener in Dallas with a red zone meltdown combined with allowing Tony Romo to drive the length of the field in the final seconds. A red zone turnover against the Falcons and another defensive collapse left the Giants at 0-2. The Giants rebound with a three-game winning streak before being blown out by the Eagles. Dwayne Harris haunts his former team as the Giants defeat the Cowboys at home. Eli Manning throws six touchdown passes against the Saints but the Giants still lose. Nevertheless, the Giants beat the Buccaneers to improve their record to 5-4. They are in first place in the terrible NFC East with seven games left to play. The 2-6 Cowboys and 4-4 Eagles are wounded and fading. The Redskins are 3-5. Even with the Patriots looming next, with Tom Coughlin, Eli Manning, and Odell Beckham, the Giants are the favorites to win the NFC East. But in a far-too-common occurrence during the Tom Coughlin era, the Giants collapse in the second half of the season. They only win one of their last seven games. The Giants have the Patriots on the ropes but Beckham and Landon Collins can’t hold onto the football. With the division on the line, the Giants fail to show up in Washington. Coughlin’s eschews a late field goal against the Jets who win in overtime as Josh Brown misses a game-tying field goal. A heroic comeback against the Panthers falls short as the defense collapses late again. New York gets destroyed in the Minnesota cold. Which brings us to Week 17. Both the Giants and Eagles are 6-9. In their last seven games, the Eagles have lost five contests and been badly beaten by the Buccaneers (45-17), Lions (45-14), and Cardinals (40-17). The Eagles are 15th in offense and 30th in defense. Chip Kelly is fired before the finale. On the other hand, it is widely speculated both inside and outside of the locker room that this will be Tom Coughlin’s last game as head coach of the Giants. There is talk about sending him out on a high note with an inspired effort against a team that has owned the Giants the last eight years. Instead an Eagles team with nothing to play for soundly beat the Giants 35-30. Coughlin is left with one last sour memory as the Eagles have now beaten the Giants 13 times in the last 16 match-ups. Once again, bad defense and red zone inefficiency lead to defeat. As the third Giants’ head coach to win two NFL Championships, Tom Coughlin is undeniably one of the top three coaches in franchise history. But in the end, he was done in by his inability to defeat his divisional rivals in recent years. In addition to the Eagles dominance over the Giants, the Cowboys have defeated the Giants six out of the last eight games. And although the Giants had fared much better against the Redskins, the Giants came up woefully short in both 2012 and 2015 against Washington with the division on the line. The Giants accrued 30 points, 30 first downs, and 502 total net yards (208 rushing and 294 passing) against the Eagles. New York had 81 offensive snaps to Philadelphia’s 65. The Giants won the time of possession battle 31:54 to 28:06 and were 7-of-15 (47 percent on third down). With numbers like that, you would expect a victory. But the team’s defense was again poor. And offensively, the Giants were only 2-of-5 (40 percent) in the red zone. The biggest error of the game came late in the 3rd quarter. With the Giants up 27-21 and driving at the Eagles’ 14-yard line, Eli Manning was sacked. The ball was knocked out of his hands and returned 83 yards for a touchdown. It was at least a 10-point swing in the game, and possibly a 14- or 15-point swing. After punting on their opening possession, the Giants scored on each of their four remaining drives of the first half with two field goals and two touchdowns. 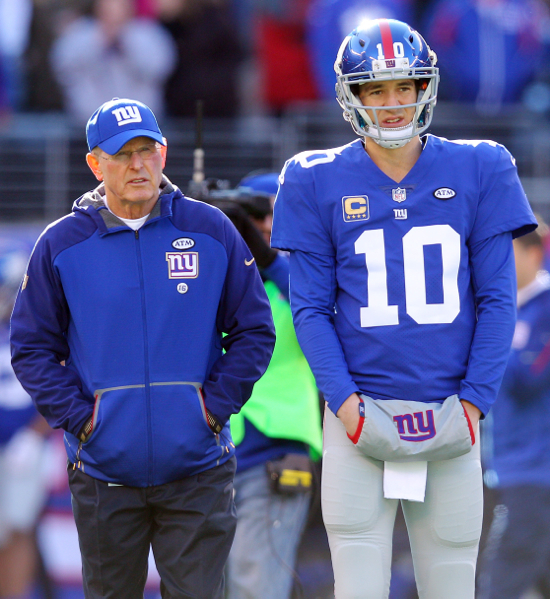 Unfortunately, the first field goal drive stalled after the Giants faced a 1st-and-goal from the 5-yard line. The second stalled after facing a 2nd-and-5 from the Eagles’ 7-yard line. The second half was not as kind as the Giants scored twice (touchdown and field goal), punted twice, had the fumble returned for a touchdown, and ended the game with a turnover on downs. There was one head-scratching call (or audible) on 3rd-and-10 in the 3rd quarter when a draw play was called. Eli Manning had a solid day, completing 24-of-43 passes (56 percent) for 302 yards, 2 touchdowns, and no interceptions. His fumble that was returned for a touchdown was probably the difference in the game but that play was more on Ereck Flowers than him. Manning did miss a wide open Myles White in the end zone on the second drive that ended with a field goal. He also missed a wide open Odell Beckham in the 4th quarter on an errant throw and threw into double coverage a few plays later on a deep pass intended for Randle. Rashad Jennings, Andre Williams, and Shane Vereen had the type of day that the Giants dreamed they would have on a regular basis in 2015. Jennings carried the ball 27 times for an inspiring 170 yards (6.3 yards per carry) and a touchdown. Williams chipped in with 26 yards on five carries (5.2 yards per carry) and Vereen 12 yards on four carries (3.0 yards per carry). Vereen also caught 6-of-8 passes thrown in his direction for 72 yards (12.0 yard average). He was a big factor on the team’s second TD drive when he ran for four yards on 3rd-and-2 and then caught three passes for 41 yards on three consecutive plays. But obviously the story was Jennings who ran with toughness and purpose. Remarkably, half his 863 yards on the season came in the last four games. Aside from one big touchdown play to Rueben Randle, the wide receivers were surprisingly quiet against a secondary that they should have destroyed. One game after his NFL suspension, Odell Beckham was held to 5-of-7 passes thrown in his direction for just 54 yards. He was also flagged with a false start. Randle caught a 45-yard touchdown pass but was held to three receptions on his other six targets for just 34 yards. He lazily couldn’t come down with a 3rd-and-7 pass on the opening drive. Hakeem Nicks caught just 2-of-4 targets for 24 yards and Myles White did not have a catch despite three passes thrown in his direction. Nicks had a chance to be a hero late in the game but dropped a deep pass from Manning on the last desperate drive. Will Tye finished his surprising year on a strong note with five catches for 67 yards and a touchdown. Tye’s run blocking is noticeably improving as well, though he did miss one block that led to a 2-yard loss. From left to right, the offensive line was Ereck Flowers, Dallas Reynolds, Weston Richburg, John Jerry, and Justin Pugh. Adam Gettis also saw some time at left guard. The good news was the 208 yards rushing. And the line looked sharp on a number of pulling efforts, especially by Pugh and Reynolds. Richburg also stood out with his effort to make an initial block, then come off his man and engage a second defender. The bad news was that pass protection was shaky at times. Eli Manning was only officially hit four times, but two of those were sacks. The line had pass protection issues on the first drive as Flowers and Reynolds gave up back-to-back pass pressures. Then Jerry was flagged for holding on a play where Manning was pressured. Early in the 2nd quarter, on 3rd-and-7, Flowers gave up the first sack when he was beat by an outside rush and Reynolds blocked his man into Flowers. Of course, the decisive play of the game was the gimpy Flowers being beat for a sack-forced fumble that resulted in at least a 10-point swing. The line did a poor job of protecting Manning on the last desperate drive as both tackles and Reynolds gave up pressure. The NFL’s 32nd-ranked defense played terribly. The Eagles scored three offensive touchdowns on their five first-half possessions as they easily drove 80 yards in five plays, 85 yards in six plays, and 80 yards in 16 plays. While the Giants did force two punts and caused a fumble in the second half, the defense also allowed a 13-play, 91-yard touchdown drive that for all intents and purposes put the game away. The Giants made the inconsistent Sam Bradford look like an all-star as he completed 30-of-38 passes for 320 yards and two touchdowns. Tight end Zach Ertz caught all nine passes thrown in his direction for an astounding 152 yards receiving (16.9 yards per catch). Wide receiver Jordan Matthews caught two touchdown passes. Running backs DeMarco Murray and Darren Sproles carried the ball 15 times for 93 yards (6.2 yards per carry) and two touchdowns. Most damning of all? The Giants’ “defense” (and I use that term loosely) allowed the Eagles to convert 10-of-13 third down opportunities, a 77 percent success rate that was the highest by a Giants’ opponent since 1970. What’s worrisome moving forward is how uninspired and confused Steve Spagnuolo’s defenders looked. Are there talent issues? You bet. But the players on the field didn’t appear to play with much effort and there were too many easy plays for the Eagles simply because defenders were out of position. For example, there was one 3rd-and-1 play where the Eagles had two wideouts split to the left with only one defensive back in the picture. It was an easy uncontested pitch-and-catch for a first down. The defense also came up small again at the end of a game, allowing the Eagles to pick up two first downs, 37 yards, and run almost three minutes off of the clock after the Giants had cut the score to 35-30 with 4:30 left to play. The starters up front were Jason Pierre-Paul at left end, Cullen Jenkins at left tackle, Jay Bromley at right tackle, and Robert Ayers at right end. Ayers played a strong game with 7 tackles, 1 sack, 3 tackles for a loss, and 2 quarterback hits. Sadly, no other Giant officially hit Sam Bradford. Pierre-Paul had six tackles and two pass defenses, Bromley five tackles, and Jenkins three tackles. As reserves, George Selvie chipped in with two tackles and a fumble recovery. He was flagged with a neutral zone infraction. Montori Hughes had two tackles and one tackle for a loss, but was easily blocked on Murray’s 54-yard TD run. Hughes did flash on a few occasions with his hustle in run defense. Pierre-Paul was successfully blocked on Darren Sproles’ 6-yard touchdown run as Sproles ran around him. JPP did bat a pass up into the air that was intercepted by Jonathan Casillas, setting up the Giants’ first touchdown drive on a short field. Jenkins was easily blocked on a 3rd-and-5 draw play that picked up a first down on the Eagles’ third touchdown drive of the first half. The Giants started in the nickel with Jasper Brinkley and Jonathan Casillas starting at linebacker. Brinkley finished the game with 9 tackles, 1 tackle for a loss, and 1 forced fumble. Casillas had 7 tackles and 1 interception. Others spotted in the game included Mark Herzlich (1 tackle) and Nico Johnson (0 tackles). The Giants linebackers looked slow, unathletic, and lethargic in coverage. The Eagles’ game plan was obvious and successful. Alternate throws to the middle of the field with short passes to the outside perimeter. Force the linebackers and safeties to run to the ball and make plays. Let this one astounding fact sink in: Bradford was 21-of-23 for 243 yards throwing to the tight ends and running backs!!! Casillas was slow to react to receivers out of the backfield and to fill the gap on Murray’s 54-yard touchdown run. Johnson got faked on a misdirection boot to his side. Later, Zack Ertz (who caught all nine passes in his direction for 152 yards) was left all alone on a 60-yard gain. Casillas did not run with Ertz and there seemed to be confusion between defensive backs Landon Collins and Prince Amukamara on the play when the tight ends crossed. Brinkley couldn’t stay with Ertz on a 19-yard completion on 2nd-and-11 down to the Giants’ 3-yard line. Brinkley did make a number of nice plays in the 3rd quarter, including the forced fumble, an aggressive tackle in the hole against the RB, and then a sure tackle after a short pass. Casillas was beat by TE Brent Celek for 24 yards on 3rd-and-5 on the Eagles’ last touchdown drive. Both Casillas and Brinkley looked awful in coverage on this drive, including Brinkley embarrassingly whiffing on an open-field tackle attempt that set up the Eagles at the Giants’ 3-yard line. The Giants started the game with Landon Collins and the recently re-signed and gimpy Brandon Meriweather at safety, Prince Amukamara and Dominique Rodgers-Cromartie outside at cornerback, and Trevin Wade playing nickel corner. Trumaine McBride was forced to play safety after Meriweather injured his knee. The only defensive back with a pass breakup was Wade with just one. The safeties were just dreadful in coverage as indicated by the receiving productivity of the tight ends. In addition, Meriweather was caught flat-footed on Murray’s 54-yard TD run. He also made a pathetic, flailing effort to tackle Ertz on his 60-yard catch-and-run. Collins looked lost out there at times. He got blocked and couldn’t make a play on Sproles’ 6-yard TD run. He later badly missed a tackle on Ertz too. On the Eagles’ third touchdown drive, on 3rd-and-10, Collins was cleanly picked off of Ertz, resulting in an easy first down. Collins was beat again by Ertz for 21 yards in the 3rd quarter. He gave up two more catches to Ertz late in the 4th quarter when the Eagles were running out the clock. Wade got beat deep on 3rd-and-3 by Jordan Matthews who thankfully dropped a perfect pass, leading to the Eagles only punt of the first half. Only two Eagles’ wide receivers caught passes and only one caught more than two passes. The wideouts were limited to a combined 11 catches for 77 yards. But Matthews caught two touchdowns. One of those was also against Wade, who struggled at times with Matthews out of the slot. He did knock away one pass intended for Matthews on one of the Giants only three third down stops. Jayron Hosley was beaten easily by Matthews for his second touchdown on 1st-and-goal from the 3-yard line. Rodgers-Cromartie and Amukamara were never really tested. Josh Brown finished a strong season 3-of-3 on his field goal kicks, including a 48 yarder. Five of his kickoffs resulted in touchbacks. The other two kickoff returns went for only 24 yards combined. Brad Wing punted three times with all three punts downed inside the 20-yard line, including at the 2-, 3- and 9-yard lines. None were returned. All six Eagles kickoffs resulted in touchbacks with no returns. The only punt returned was by Odell Beckham for five yards.